On November 1 the Bureau of Economic Analysis released GDP numbers by industry (which is the source for all data in this article). Representing value added, it is an often overlooked way to slice GDP and get a different view of our economy than the usual forms: spending and income. Data on value added is best known as the tax base for value-added taxes (VATs) used instead of sales taxes in many countries. It is also useful to explain the industrial structure of an economy, which in turn is helpful in devising tax systems, regulatory structures and even monetary and social policies. Manufacturing has been growing more slowly than the private-industry average, but it has only overtaken by the industry known as "professional and business services." There is a reason for this that is not necessarily related to the migration abroad of manufacturing jobs. This industry includes legal services, computer systems and solutions architecture, accounting, architecture and engineering consultants, research and development, advertising and public relations, and other specialized professional services. The growth in this industry reflects the growth in consulting, especially in computer systems and solutions architecture. 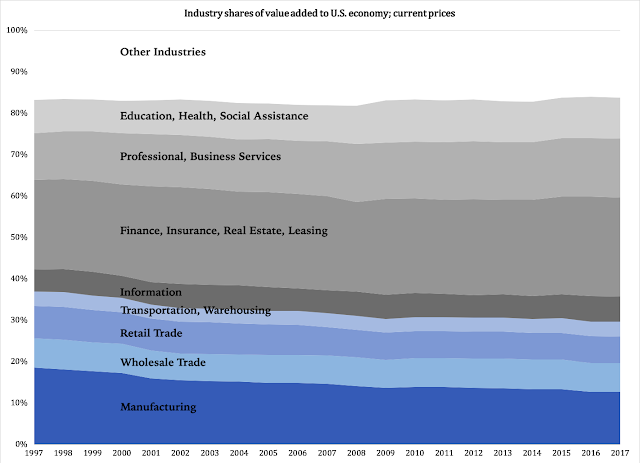 In current prices, its value added has increased by 329 percent from 1997 to 2017, far above the 189 percent for the professional-services industry as a whole. Notably, employment services comes in second at 290 percent, with management and technical consulting third at 273 percent. This indicates that American businesses have become more flexible in their organizational structure, farming out more work to consultants. It also shows that professionals increasingly prefer to work in a consulting environment as opposed to traditional, salaried employment. On the other hand, it can be the result of a more short-sighted strategy where the eyes of corporate management is on the bottom line, rather than long-term strength. As for manufacturing, its resiliency is remarkable given regulatory and tax policies over the past 20 years; the numbers presented here precede the reforms under the Trump administration. We will probably see positive effects in the 2018 figures from regulatory roll-back and the substantial cut in corporate income taxes. Overall, the U.S. economy is in good shape. The big, dark cloud over it is the giant national debt, which is not only jeopardizing private-sector growth but also becoming a problem for our national security. It is time for Congress and the president to take the debt problem seriously, but they need to begin with reining in spending; if they don't, they will destroy the renewed path to prosperity that the Trump administration's deregulations and tax cuts have opened up.